The Princeton training program makes learning fast and easy. Our computer recorded real time movies will show you how to create the "losers" chart. Approximately each minute this chart refreshes as it looks for stocks that have the largest price loss. 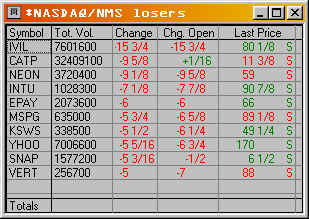 The top 10 list of losers is updated automatically with the stocks that are losing the most money.